The national inception workshop for the Green Climate Fund (GCF) Readiness Program for the FSM was held in Pohnpei State, from November 21 to 24, 2016. The workshop was attended by the key stakeholders for climate change from the four States including the traditional leaders and dignitaries from both the national and state governments. Lieutenant Governor of Pohnpei State, Honorable Reed B. Oliver, gave an invigorating welcoming address and referred to the recently released documentary on climate change. He expressed his gratitude for the opportunities offered by the Fund, especially as a way to bypass the ‘climate change deniers’, and urged participants to keep engaged with the task of reducing emissions and increasing resilience of communities in the FSM, beyond the workshop. On the closing day of the workshop, the Honorable Sihna Lawrence, Secretary of Finance and the designated GCF National Designated Authority (NDA) gave an inspiring yet cautious closing address. The Pacific islands, amongst the most vulnerable to the impacts of climate change, have displayed global leadership this weekend when the Paris Agreement opened for signing on 22 April. 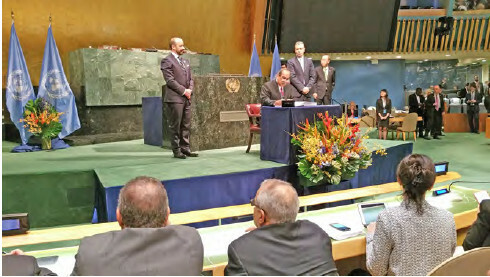 Fiji, Nauru, Palau, Republic of the Marshall Islands, Samoa and Tuvalu were six of the 15 overall countries that submitted their ratification during the special signing ceremony at the United Nations Headquarters in New York. “We congratulate and commend our member countries for their leadership in not only signing but also taking that extra crucial step to ratify the Agreement, helping to ensure it will come into force,” said Mr. Kosi Latu, Director General of the Secretariat of the Pacific Regional Environment Programme (SPREP). The Paris Agreement has far exceeded the historical record for first-day signatures to an international agreement. Overall there were 175 parties that signed the Paris Agreement, for which 12 out of 14 Pacific islands put pen to paper in signing the agreement signifying commitment. “The signing of this agreement comes at a critical time for Pacific nations, and the Pacific Community will maintain unerring commitment to work with other CROP agencies and the region’s countries and territories to maintain the momentum for collective action,” the Pacific Community Director-General, Dr Colin Tukuitonga, said. The Federated States of Micronesia, Fiji, Kiribati, Nauru, Palau, Papua New Guinea, Republic of the Marshall Islands, Samoa, Solomon Islands, The Kingdom of Tonga, Tuvalu, and Vanuatu were the Pacific islands that signed once it was open for signature in New York. “Only by working together can we address the most serious issues brought upon us by the effects of climate change. The CROP agencies will continue to work together, The Pacific will continue to work together, and the World must continue to work together, to save our vulnerable brothers and sisters, and future generations,” said Dame Meg Taylor, Secretary General of the Pacific Islands Forum Secretariat. The Pacific islands contribute to less than 0.03 percent of the world’s total greenhouse gas emissions but are amongst the most vulnerable to its effects. The island region is also amongst the first to feel the impacts of climate change. Noumea, New Caledonia – Fiji’s successful bid to preside over next year’s United Nations Climate Change Conference (COP 23) is the added muscle needed to trigger more action to combat climate change for small island states, according to the Director-General of the Pacific Community, Dr Colin Tukuitonga. “This is a tremendous achievement for Fiji who continue to demonstrate strong leadership and commitment on the international stage,” Dr Tukuitonga said. “On the same note, this is very significant for the entire Pacific region. The Pacific has been staunch in presenting a united voice on climate change and this appointment acknowledges support from the wider global community for the voice of the Pacific. “It also presents an opportunity to harness more visibility and support for effectively addressing this global challenge, in particular its negative impacts on small island communities everywhere,” Dr Tukuitonga said. Fiji’s appointment makes it the first Pacific island nation to take on this important role at a COP. “The Pacific Community will continue to serve and support its Pacific Island members, by utilising its scientific and technical expertise to address and adapt to this ongoing climate change challenge,” Dr Tukuitonga said. In February, Fiji’s parliament became the first in the world to approve the ratification of the Paris Agreement on Climate Change; Fiji’s Peter Thomson is the current President of the United Nations General Assembly and Fiji also will co-organise the SDG14 Ocean Conference in June 2017 at UN headquarters in New York, thus demonstrating the country’s leadership in bringing together the international community on climate change and sustainable development. New York—On Friday April 22, 2016, President Peter M. Christian participated in the High-level Signature Ceremony for the Paris Agreement at the United Nations Headquarters in New York City. During the Ceremony, President Christian joined representatives from 174 other countries in signing the Agreement, marking the largest number of countries ever to sign an international instrument in a single day. The Conference of the Parties to the United Nations Framework Convention on Climate Change adopted the Agreement in Paris last December. The Agreement is the first universally applicable international agreement to reduce greenhouse gas emissions. The Agreement commits all of its Parties to keep global temperature rise this century well below 2 degrees Celsius above pre-industrial levels and pursue efforts to limit the temperature increase even further to 1.5 degrees Celsius. The Agreement also provides for enhancing the ability of all countries—particularly developing countries—to deal with the impacts of climate change, including loss and damage. To achieve these goals, the Agreement provides for climate financing, a new technology framework to support research and development in climate technology, a new capacity building framework to enhance the capability of developing countries to take effective climate change action, and a robust transparency framework to ensure that Parties properly and fully account for the actions they take under the Agreement. The Agreement will enter into force after at least 55 Parties representing at least 55 percent of global greenhouse gas emissions ratify the Agreement. In the atmosphere, 500-millibar height pressure anomalies correlate well with temperatures at the Earth's surface. The average position of the upper-level ridges of high pressure and troughs of low pressure—depicted by positive and negative 500-millibar height anomalies on the June 2016 map—is generally reflected by areas of positive and negative temperature anomalies at the surface, respectively. The Federated States of Micronesia in the Pacific has 30,000 citizens living on atolls that are vanishing due to sea level rise from climate change. Today they have drinking water shortages and food security is in peril. Sea level rise is a 50-year challenge confronting all Islands and LYON.US.com is committed to finding solutions for all our Island clients. Ocean Rise - How much? How soon?